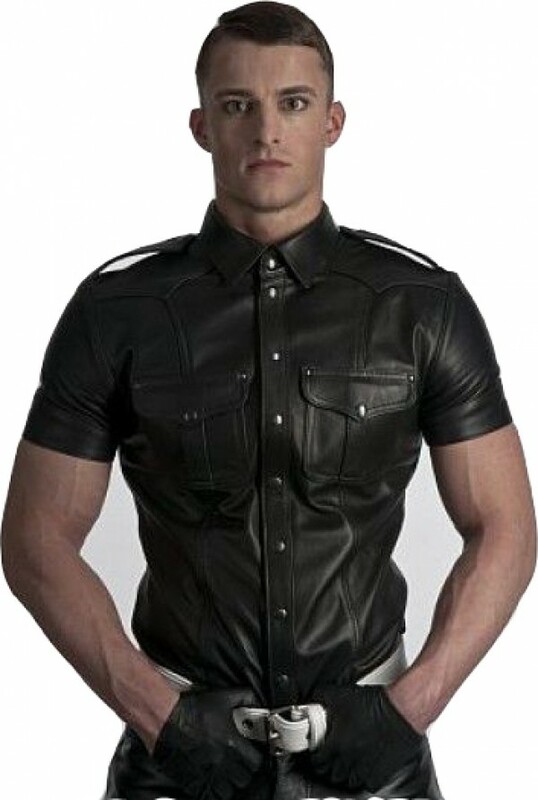 Exercise your authority with the leather police shirt, a police shirt that lets everyone know who's in charge. Whether it's worn as a part of a uniform, for costuming, for clubbing or for cosplay, this police shirt never fails to attract attention. Exercise your authority with the leather police shirt, a police shirt that lets everyone know who's in charge. Whether it's worn as a part of a uniform, for costuming, for clubbing or for cosplay, this police shirt never fails to attract attention. The shirt is made to your exact measurements to give you a perfect fit through both the arms and chest. For added style, contrast stitching is featured on the arms, on the snap-down shoulder epaulettes and along the snap-down patch pockets at the chest. The fitted short sleeve shirt has a classic turn down collar, and you can make it your own by selecting your favourite colour of genuine leather for us to produce your custom-made leather shirt from. An outstanding collection of everything leather.I bought chaps, leather jacket and leather officer shirt. More to buy as well. This shop not only has the highest quality riding leathers but are just the nicest people! They make you feel at home and like family. Love this place.